If not part of a national dress or a garment to be worn in order to honor Scottish heritage, what then could make men, wish to wear a kilt? Just think of anatomy. Should clothing be invented from scratch it is likely that rest rooms signs were interchanged, meaning that trousers would be the primary choice of women, whereas skirted garments should probably be preferred by men. A casual kilt, for example, can with a few accessories be upgraded to rather formal functions, not possible with blue jeans or shorts. In most European countries a kilt can be worn year-round. At temperatures between -3 and 30 C it is perfect. In winter, your knees are uncovered, but they aren’t cold. The kilt itself with its four to seven meters of fabric, as well as the kilt hose, will keep the remaining parts of your legs efficiently protected against coldness. Your only problem might be all the people freezing in their trousers asking you if you are not cold. In summer the kilt is protecting against heat - and sun. In fact, on most days you’ll feel more comfortable than when in shorts. The manly wardrobe might not be the most inspiring thing the world has seen. That is my opinion. And I like the tartans and so might you. Thousands of tartans are available, and the kilt itself shall make a splendid addition to your wardrobe, because you no longer have to wear trousers all the time. - even if by far less than you might fear - or hope for. - again due to anatomy and form follows function. Who will wear a kilt? No valid statistics exists, but from kilt forums and the like it is my impression that men in kilts demographically on most criteria (age, civil status, family size, education, and income) will resemble men in general. They have just found out that wearing a kilt makes sense to them. By the way, kilt wearing has nothing to do with sexual preferences. I mention this, because ignorant people often question such things and will connect everything they don’t understand – which can be pretty much – with sexual deviating. What is the difference between men wearing a kilt and men in general? What difference does it make whether you are Scottish or not? Scottish men often regard the kilt formal attire, which they will wear primarily or only at special events. It is formal only or formal first. 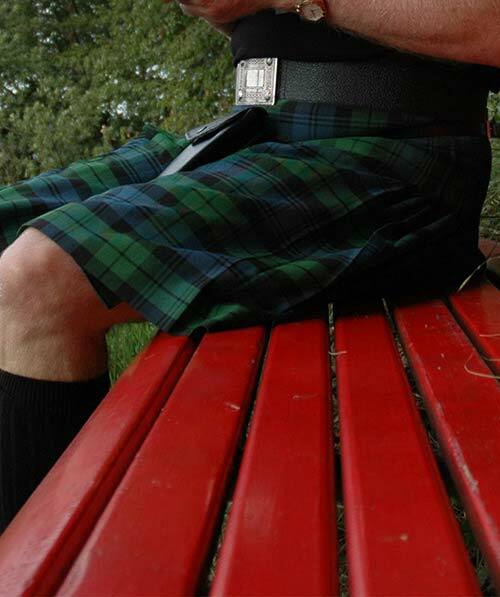 Men with Scottish roots (for example living in the US or Canada) will, like Scots, wear a kilt at special events to show off their heritage but will very often also wear their kilts on a regular basis. That is formal first, then casual. Men without Scottish heritage will hardly wear a kilt as a substitute for black or white tie. To them the kilt is first of all daily, casual wear in their spare time. Following advice, aimed at dress-up situations, means that they should often invest in a kilt and accessories which are overkill. It is casual first. Often it is casual only. Put into perspective, how should you think about a man going grocery shopping on a hot Saturday morning wearing a tux? Or just in a business suit with a white dress shirt and a necktie? It is the same with a kilt and accessories. Does a kilt police exist? O yes. It consists of men zealously watching every man wearing a kilt and whom they shall rebuke, should he dare deviate from rules, or worse, should he not know them. Fortunately, they are very few, are self-appointed, and with no possibility to punish the offender. It is most unlikely that you should ever meet such guy, at least when you keep away from highland gatherings and the like. More seriously, however, an imaginary kilt police may exist within the heads of many insecure kilt wearers, making them frighten to do anything wrong. Therefore they will often over-dress, which, in fact, might draw considerably more attention to them, than had they just worn a kilt and a few accessories. You mean going without underwear? But YES. And NO. Wearing the kilt as a true Scotsman is called going regimental or commando. In kilted Scottish regiments underwear was (still is?) not allowed and it is said that sometimes at parades it was by means of a mirror on a stick checked whether the soldiers obeyed to rules or not. If underwear was seen in the mirror the soldier would be punished. Today a selfie stick had been the thing to use. Fortunately it is entirely up to you to decide what YOU are going to wear under YOUR kilt. Some will say that they never ever wear underwear beneath their kilt. Some couldn't imagine being without; and for others it is an on and off business.
. Whatever your choice you better keep it to yourself. If asked - and you will be, believe me - my advice is to never give a definite answer. The uncertainty about the "secret" may very well be the reason why the kilt is still so very much alive. How could I, being not Scottish wear a kilt? Like said already, in recent years more and more men in a lot of countries, with and without a kilt tradition, and no matter their nationality, colour and heritage, do wear kilts. And, no doubt, even more men should like to, had they the courage to do so. The movie Braveheart (1995) and the Internet - since 2nd half of the nineties - have probably started this development by convincing men with a (secret) preference for kilt wearing that they were not alone and could, in fact, wear a kilt, should they feel like it. Once blue jeans were something American cow-boys were wearing. Now everyone wears them. Once, especially German boys would all over Germany wear short “Lederhosen”, not just boys living in Bavaria. Some traditionalists might be against non-Scots wearing a kilt, as they are sometimes against fellow-Scotsmen wearing a kilt as daily attire or outside Scotland. These seem to be few, however. Highland wear is something unique and makes a living for a lot of Scotsmen. Do other people believe I'm Scottish when they see me in a kilt? It depends on where you are living, I suppose. 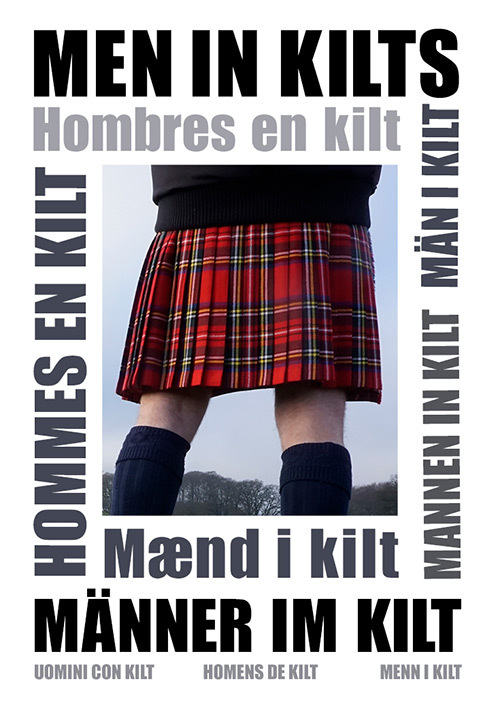 In Scandinavian countries you are always addressed in the local languages, indicating that you are regarded just a country fellowman wearing a kilt. Almost the same is the case in Germany and Holland. In Southern Europe it is probably more expected that you have at least some connection to Scotland. Should I try to "play" Scottish? No. To non-Scots the kilt is just a comfortable, versatile, and innovative garment. Accordingly you should, to my opinion, also avoid accessories too much connected with Scottish national dress like the bonnet. Should I try to eventually give up trousers? No. Variety is the spice of life. How do I start wearing a kilt in public? The answer should be: Open the door and out you go. But for most men it is not as simple as that. If a man wants a tattoo, he'll get it. If he wants his hairs to grow long he will have them to. If he wants his tongue, nose, lip, ear or any other part of his body pierced, he will have it done. But if he wants to wear a kilt, which is definitely considered a man's garment, he might not dare to wear it out, because of a slight resemblance with a woman's skirt or just because it is different. It is ridiculous, don't you agree? Should I tell people I know that I consider wearing kilts or already do? Yes, it might be a good idea. No rumours, then. You could either just tell them up front or have them see pictures, on some of which you are wearing a kilt. But of course you can also just start wearing it in public and take it step by step. People, with whom you are acquainted, will ask, of course, and you must tell them about your reasons why (comfort, variety, difference or simply that you like wearing it) and how you got the idea in the first place etc. By the way, now with selfies, Facebook, Twitter, Pinterest, and Instagram it has never been easier to inform friends about changes in lifestyle etc. Add kilt, kilts and kilt wearing to your interests and activities. Or send a message that you have received a kilt and tell about the advantages wearing it etc. And post pictures showing you in your kilt. Of course you won’t get 100% coverage but many shall know in a split second. And when that is behind you, it is much easier. If you make a holiday in Scotland (could be a good idea), try on a kilt and on social media tell about your trip and about you having tried on a kilt. And don’t forget to post pictures. You liked it. And you bought it. And you shall wear it. How about my significant other? Your wife might worry the most about your kilt wearing – and in all probability without reason, at all. In fact, it seems that many women like seeing men in kilts, even if not always to the same degree, should it be their own husband. But there are examples on the internet where women have wanted her husband to wear kilts and have talked him into it. If she has concerns about you wearing a kilt they probably concentrate about how surroundings shall react (see below) but foremost about whether she can trust you. She might fear that you might be gay. Nothing wrong at all with men being gay, but in a heterosexual relationship it simply does not work. Besides, most gay men wear trousers. Or should the kilt be just your first step into crossdressing? Or should you have a secret wish to be a woman? Hopefully you can convince her that she has nothing to fear – and that you are telling her the truth! What she’ll get in return, is probably a thankful, caring and faithful husband. People who don’t know you couldn’t care less how you are looking or how you are dressing. Kilt wearers will largely state that it is a non-event and that their surroundings, relatives and people in their neighbourhood, very soon got accustomed to see them in kilts. Never ever think that you have to "excuse" that you are wearing a kilt. It has been your decision. To you it is a natural thing. It has or is about to become a lifestyle of yours, so to say. If just more men (and their wives) would consider their "world" just half as tolerant as in fact it is, we should see a lot more of kilts around, I’m sure. Greg, you are wearing kilts on a regular basis, despite you are not Scottish and don’t live in Scotland. When and how did it start? It more or less started back in the mid-nineties during a vacation in Scotland with my wife and, by then, teenage daughter. One afternoon, in Edinburgh, they wanted to go to the Waverly shopping mall, whereas I would rather stroll around for an hour or two and take some pictures. To make it short, in a corner house in High Street I noticed a shop selling highland wear. At lot of shops in Edinburg are, so no big deal about that. But here were no tourists and looking through the windows no customers seemed to be inside and I stepped in. The reason was that the year before I had wondered that there were also many highland stores in London and as an external teacher at a business college I had since then had a business case for my students in mind where highland wear should be the “impossible” part. It was before the Internet and basic information, like what is worn with a kilt, seemed hard to get. Now I saw the possibility. Having got the needed information, the sales assistant or owner asked me if I didn’t want to try on a kilt. Well, I had taken his time, so I thought I shouldn’t resist. That might have been one of my worst decisions. In no time he took my measures, went over to a dress rail with perhaps 50 kilts on it and found within half a minute two kilts which he suggested me to try on. I did. To me only the tartans were different. A fine strategy. Having me try on two kilts meant that I should be wearing them for a longer period. One had been enough. Just a few steps and looking into a mirror gave me the feeling that a kilt was something extremely comfortable to wear and that there was nothing female about it. I got hooked, so to say. Did you buy the kilt? No. It was quite expensive and what should I use it for, even if he said that he had a lot of non-Scottish customers from a lot of countries? So, when I left, I had in my hand his business with my measures written on it, just in case, 36”, 43” 23”, referring to length, hip, and length, just in case. But when did you get your first kilt, then? It might have been about two years later, after I had got access to the rather new internet. During my surfing around I found out that there were “message boards” for men wearing or wanting to wear kilts and/or skirts. And that you could actually order a kilt on the internet. On a site I happened to find a “casual affordable kilt” that looked good. Should, should not? It wouldn’t ruin the family economy in any way, but… End of story: A few weeks later I was the owner of this kilt plus some accessories. The quality was not quite up to the standard of the one I had tried on in Edinburgh. The fabric was not wool but polyester and only four yards, but being a non-Scot with absolutely no possibilities to wear a kilt at dress up situations it made the point. Did you then start to wear it out right away? No. My wife thought wearing a kilt in public might be somewhat problematic and, in fact, so I did. But when on holidays abroad I would sometimes wear it. And inside home, of course and in the garden and when empting the letterbox. It was in 2005. We had been on holiday in Italy, where I had been wearing the kilt for some hours every day and had got quite many compliments from the local people. And as I then a few months later at a garden party with our neighbours realized that in fact they all knew I was wearing a “real kilt with a purse”, there was no reason trying to keep it a secret any longer. And I didn’t. What to find on the Dress2Kilt site? What type of kilt? Casual or smart casual? VAT and taxes? How to get sizes right? Let's imagin we order a kilt.